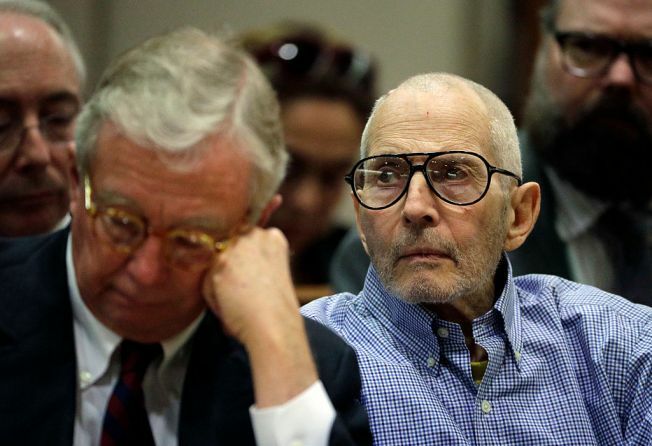 In this Dec. 21, 2016, file photo, real estate heir Robert Durst, charged for the 2000 killing of his friend Susan Berman, appears in Los Angeles County Superior Court during a preliminary hearing in Los Angeles, Calif.
Robert Durst, the 75-year-old New York real estate scion whose sordid past was detailed in an HBO documentary series, was ordered Thursday to stand trial for allegedly killing a close friend in Los Angeles' Benedict Canyon 18 years ago. Durst is charged with murder for the killing of Susan Berman, 55, who was found dead in her home on Christmas Eve 2000. Prosecutors theorize that Durst killed Berman because she was about to be questioned by New York police in a renewed investigation into the 1982 disappearance of his first wife, Kathleen "Kathie'' Durst, who has never been found. Durst is due back at the Airport Branch Courthouse on Nov. 8 for arraignment. The murder charge against him includes the special circumstance allegations of lying in wait and killing a witness to a crime. There is also an allegation that he personally used a handgun to carry out the murder. At the end of a preliminary hearing that spanned several weeks, an attorney for Durst argued Thursday there was no hard evidence -- such as DNA, fingerprints or witnesses -- linking him to Berman's killing. He remains jailed without bail. Durst has been behind bars since his arrest March 14, 2015, in a New Orleans hotel room. He was taken into custody hours before the airing of the final episode of HBO's documentary series "The Jinx: The Life and Deaths of Robert Durst,'' which examined the disappearance of his wife, and the killings of Berman and a Texas neighbor, Morris Black, in 2001. Durst went on trial for Black's death and dismemberment after a nationwide manhunt in which he was located in Pennsylvania, but a jury acquitted him of murder after agreeing with Durst's contention that he had killed his neighbor in self-defense. Durst has been long estranged from his real estate-rich family, which is known for ownership of a series of New York City skyscrapers -- including an investment in the World Trade Center. He split with the family when his younger brother was placed in charge of the family business, leading to a drawn-out legal battle. Earlier this week, prosecutors introduced a motion seeking to admit into evidence in the case comments Durst made in the DVD commentary for a movie based on his life, saying the comments amounted to a tacit admission of guilt. Prosecutors contend that after reading the script and seeing the movie, Durst actually praised the film and agreed to be interviewed for the DVD commentary, during which he says the film "was very, very, very close in much of the ways about what, pretty much, happened,'' according to the court motion.